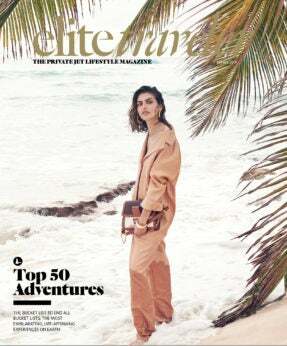 A true visionary in the haute couture world, Coco Chanel changed the way women dressed and accessorized forever. 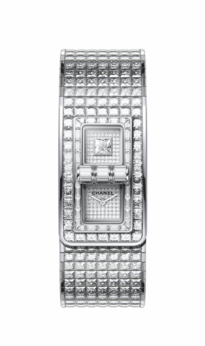 Now, Chanel unveils a new timepiece collection in tribute to her enduring legacy: Code Coco. This stunning 18K white gold high-jewelry bangle watch is covered in nearly 55 carats of diamonds, mixing baguette-, brilliant- and princess-cut diamonds. 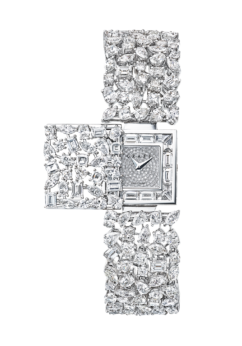 While many high-jewelry watches focus the gemstones on the dial, Chanel has meticulously set 294 diamonds on the bracelet, making it more a statement piece than a way to check the time. The watch is powered by a quartz movement and is water resistant to 98 ft. 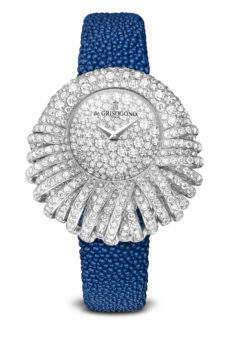 It is closed using a turning lock system that shimmers with 15 baguette-cut diamonds.